Digital Surrogates from the College of Engineering Historical File, include a select portion of correspondence and related materials, reports, programs and brochures, and newsletters relating to the Engineering Open House, the renaming of the Engineering Research Laboratory as the Mechanical Engineering Laboratory (1996) and the Department of Aeronautical Engineering to the Department of Aeronautical and Astronautical Engineering (1961), the dedication of the William L. Everitt Laboratory (1987-1988), and speeches of Dean Daniel C. Drucker. 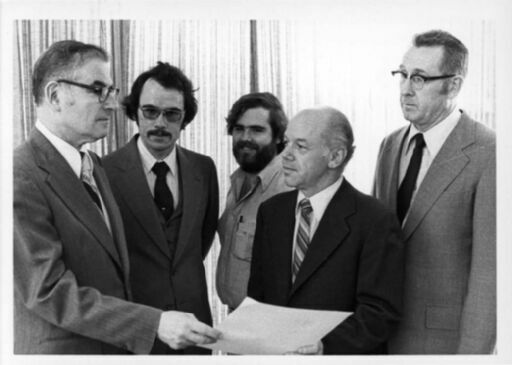 Additional digitized material is available upon request, including correspondence between Van Valkenburg and alumni from the Department of Theoretical and Applied Mechanics (TAM) regarding the dissolution of the department. The College of Engineering Historical File (Digital Surrogates), 1908-1996 are managed by the University of Illinois Archives and do not feature precise descriptive information for each item. Discover their contents by browsing the folders and files. For more information, contact an archivist at illiarch@illinois.edu.